Red Sands Video Slot Guide & Review - Casino Answers! 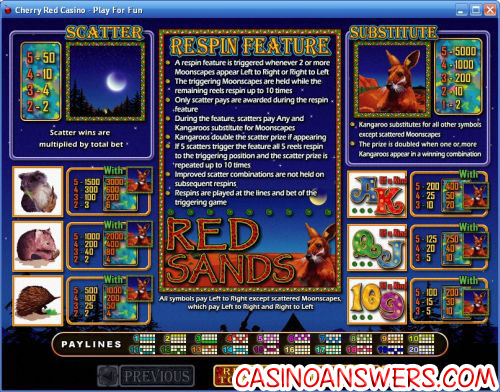 Red Sands is a 5-reel, 20-line video slot developed by Realtime Gaming, featuring a wild substitute symbol, scatter wins, a re-spin feature and a progressive jackpot. You can play the Red Sands Real-Series Video Slot game at King Solomons Casino or at US-friendly casinos Aladdin’s Gold Casino and Slotastic Casino. Select your bet per line on the Red Sands pokie slot machine by using the arrows next to “Bet.” Bets available are $0.01, $0.02, $0.03, $0.04, $0.05, $0.06, $0.07, $0.08, $0.09, $0.10, $0.25, $0.50, $1, $2.50 and $5 per line. You can also select the number of paylines you wish to play (up to 20) by clicking the arrows next to “Lines.” The lowest total bet possible on Red Sands is a penny per spin. The highest total bet on Red Sands is $500 per spin. To play the Red Sands video slot, hit the “Spin” button to spin the reels. At any time during a spin, hit the “Stop” button to use the Red Sands skill stop feature and manually stop the reels. The highest paying symbol on the Red Sands slot game is the Kangaroo symbol. 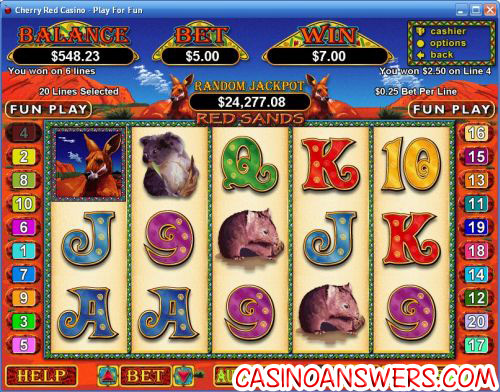 5 Kangaroo symbols will pay out the 5000 coin top fixed jackpot on the Red Sands slot machine. The Kangaroo symbol is wild and will substitute for all symbols in Red Sands except for the Scattered Moonscape symbol. The prize is doubled when one or more Kangaroo symbols participate in a winning combination. The scatter symbol on the Red Sands video slot is the Moonscape symbol. 2, 3, 4 or 5 Scattered Moonscapes will pay out 2X, 4X, 10X or 50X your total bet respectively. When two or more Moonscape scatter symbols appear left to right or right to left, you will trigger the Red Sands re-spin feature. The reels with triggering Moonscapes are held while the remaining reels re-spin up to 10 times. Only scatter pays are awarded during the re-spin feature. During the re-spin feature, scatters pay anywhere on the reels and Kangaroos will substitute for Scattered Moonscape symbols (and will double payouts). If 5 scatter symbols trigger the re-spin feature, all 5 reels will re-spin to the triggering poisition and the scatter prize is repeated up to 10 times. Improved scatter combinations are not held on subsequent re-spins. Re-spins are played at the lines and bet of the triggering game. Red Sands is home to a progressive jackpot, which is currently at over $24,300 and rising faster than you can throw a boomerang. To win the Red Sands progressive jackpot, all you have to do is play, as it is won randomly. There is no winning combination required to take this jackpot home! Progressive Jackpot wins are added to other wins. Random Jackpot contribution is no more than 1.5% of the total Return to Player. Hit the “Autoplay” button to open the autoplay settings on the Red Sands slot game. You will be able to set the number of spins, set it to stop when the jackpot is won, stop if a win exceeds or equals (any amount you input), stop on any win, stop if your balance increases/decreases by any amount you input and stop once the feature is triggered. You can stop Red Sands’ autoplay mode using the “Stop Auto” button. You can also find Turbo Play in the autoplay settings to speed up gameplay. RTG’s Real-Series Video Slot Series is extremely consistent and as a part of this great series, Red Sands does not diverge from the pack. The Red Sands video slot offers the player a decent top jackpot, a great progressive jackpot and a free spins feature (or variation thereof). For Aussies and other players outside the United States, the best place to play the Red Sands gaming machine at at King Solomons Casino. For Americans (as well as most other countries) who want to get in on the action on the Red Sands video slot game, we recommend you take advantage of the 200% unlimited bonus at Aladdin’s Gold Casino! Where can I play a free Flash game of the Red Sands slot machine game? For a free Flash game of the Red Sands video slot, you can visit your choice of King Solomons Flash Casino, Aladdin’s Gold Flash Casino and Slotastic Flash Casino. You can play for free or play for real money. If you experience problems with the Instant Play Flash casino software, make sure you have the newest version of Adobe Flash Player installed. Are players from the United States able to play the Red Sands casino game for real money? Casino gamers from the United States of America are welcome to sign up, deposit and play at both Aladdin’s Gold Casino and Slotastic Casino, where you can find the Red Sands video slot as well as over 100 other exciting casino games. How do I win the Red Sands Random Progressive Jackpot? To win the Red Sands progressive jackpot, all you have to do is spin the reels and play the Red Sands slot. It’s a randomly triggered progressive jackpot, so any spin you make can win, regardless of winning combinations. If you’re looking at bettering your odds of winning the progressive jackpot, try increasing your bet per line. Where can I play the Red Sands Slot Flash Game?